with the name of his child. 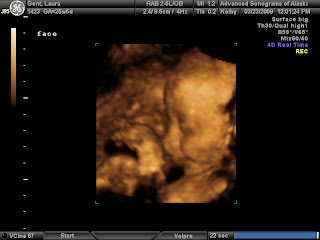 Delia Kate was in a breech position during today's ultrasound. 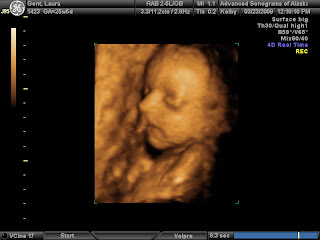 She was transverse (side to side, not up and down) at her last ultrasound. Tonight, at water aerobics, I dove headfirst into the pool in an attempt to flip her headside down. Flip she did...and then she flipped right back as soon as I angled my body toward the surface of the water. Determined not to be breeched out of the birth center, I lay in bed tonight and gently nudged her head down and her bum up. I can't be certain that she has moved into a head-down position -but I am feeling kicks in my ribs where I used to be feeling hiccups and hiccups in my cervix where I used to be feeling kicks. So I'm hopeful Delia and I have accomplished an early station-ready position. Keep your fingers crossed that she doesn't flip herself again before 30 weeks! She's so beautiful! And what a lovely name.